append ml, as a 64-bit big-endian integer. So now the message length is a multiple of 512 bits. ^ Marc Stevens. hashclash - Framework for MD5 & SHA-1 Differential Path Construction and Chosen-Prefix Collisions for MD5. http://code.google.com/p/hashclash/. ^ http://debugmo.de/?p=61 Debugmo.de "For verifying the hash (which is the only thing they verify in the signature), they have chosen to use a function (strncmp) which stops on the first nullbyte – with a positive result. Out of the 160 bits of the SHA1-hash, up to 152 bits are thrown away." ^ Christophe De Cannière, Christian Rechberger (2006-11-15). 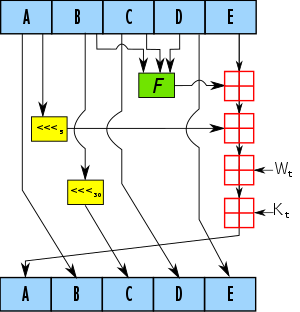 Finding SHA-1 Characteristics: General Results and Applications. http://www.springerlink.com/content/q42205u702p5604u/. ^ Stéphane Manuel. Classification and Generation of Disturbance Vectors for Collision Attacks against SHA-1. http://eprint.iacr.org/2008/469.pdf 2011年5月19日閲覧。. ^ When Will We See Collisions for SHA-1? “Proposed Revision of Federal Information Processing Standard (FIPS) 180, Secure Hash Standard”. Federal Register 59 (131): 35317–35318. (1994-07-11). http://frwebgate1.access.gpo.gov/cgi-bin/waisgate.cgi?WAISdocID=5963452267+0+0+0&WAISaction=retrieve 2007年4月26日閲覧。.